ORP Warszawa was a Kotlin-class destroyer. Built in Leningrad in the 1950's, she was originally named Spravedlivyy in the Soviet Navy. She was later transferred to the Polish navy in 1970, the only ship of this class to be so transferred. She served until 1986 when the vessel was decommissioned. Project 56AE: 1× twin S-125 Neva/Pechora (NATO SA-N-1) SAM (16 missiles), 2× 130 mm (5.1 in) guns (1×2), 4 × 45 mm (1.8 in) (1×4), 5 × 533 mm (20 in) torpedo tubes (1×5),2× RBU-2500 ASW rocket launchers. This book is soft-cover of 82 pages in 8 1/4" x 11 3/4" page format. It comes in a clear self-sealing envelope, with a pair of cardboard glasses that have one red lens and one blue one. To use to see the illustrations in 3D. 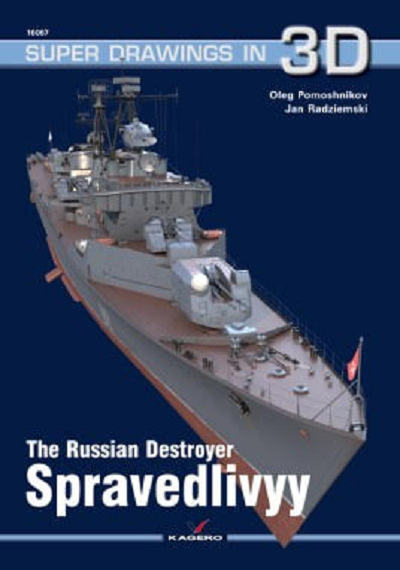 The book contains 49 color 3D walk-around type illustrations of every inch of the exterior of the Spavedlivyy and the smaller auxiliary boats it carried. Inserted into the book is a large sheet that is 27" x 19" format, folded four times to fit the book. It is printed on both sides with line drawings. The face side has a port, starboard and top view of the Spravedlivyy in 1/200 scale. The reverse side has line drawings of the search lights, turrets torpedo launchers, small auxiliary boats, radar and a front and bow view. I find no mention of any model kit of this destroyer anywhere on the web. This book will be of great interest to naval historians.